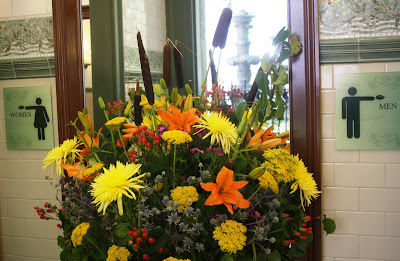 Bryant Park Blog: Help Us Win America's Best Restroom! Help Us Win America's Best Restroom! Our public restrooms have placed among the top ten nominees for the 2010 America's Best Restroom Award! Since 2002, the Cintas Corporation has honored the most unique, impressive restrooms across the country with the Best Restroom Award. Nominations are submitted by the public at the beginning of the year, and the ten finalists are chosen by Cintas. The winner of the award will be decided by a public vote happening now through August 31, on www.bestrestroom.com. If you've visited the Bryant Park restrooms, you already know about our full time attendants, fresh cut flowers, ambient music, scented oil diffusers, and no-touch fixtures. Located at the 42nd Street side of the park between Fifth and Sixth Avenue, it is one of the most heavily used public restrooms in Midtown...and certainly the cleanest! We work hard to create a pleasant, and even memorable, restroom experience every day for our visitors. If you've ever taken advantage of our facilities (or just want to see New York City take top place in the competition) please take a minute to click here and vote for Bryant Park as the number one public restroom in America! LOL interesting article. Can these public restrooms be installed in ball parks?